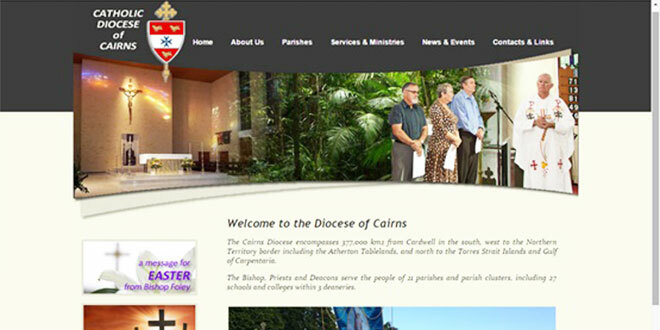 COMMUNICATION is the key attribute for Cairns diocese re-designed website www.cairns.catholic.org.au. Cairns diocese digital communications officer Vicki Crockett said the visually appealing site went live on February 18 and endeavoured to reflect, report and most importantly communicate what was happening in communities and parishes. The site features a parish index, containing Mass centres, contact details, Mass times, photos and maps of churches. It also includes a bulletin board, a space to make the community aware of upcoming events. “The ‘about us’ section of the page has a timeline and photos summarising the history of the diocese,” Mrs Crockett said. The diocese’s chief executive officer Kevin Malone said there were a number of parties involved in producing the end result. “The construction of a website involves the efforts of many people, both in a technical capacity and as contributors of content,” Mr Malone said. Mr Malone thanked parish priests, secretaries and administration staff for their much valued feedback in the process. Next: What will be Brisbane’s monuments of mercy?